This is a simple curry in Chinese style very easy and quick to make. This goes well with rice or any Indian breads. Clean the cauliflower florets well in hot water. It is better to soak them for ten minutes in hot water to which some salt is added. This will kill any worms in them. Now heat Oil in a pan fry onions till they turn pink. Now add garlic and fry for few minutes. Add chilly garlic sauce and tomato sauce and fry for a minute or two. 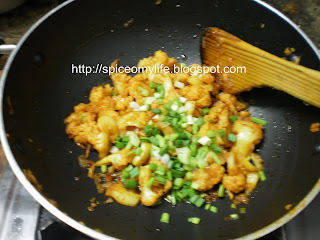 Add the cauliflower florets and salt. Mix well and fry. Serve hot garnished with finely chopped spring onions. If you want it with gravy, mix 1/2 Tbsp of corn flour in cold water and add to the curry. Let it cook for sometime time till the sauce reaches the required consistency. You can add a tsp of sugar to make it a little sweet. Chopped ginger can also be used along with garlic. Be careful while adding salt as the sauces contain some amount of salt and also the florets were soaked in salt water. If you want the curry to be crunchy, first fry the florets in oil well, keep aside and follow the rest of the procedure. Add the florets in the last.